Turquoise is called cousin brother of Lapis Lazuli. It has been using in jewelry, rings, decoration and healing stone for many years. Oldest proof for this gem was found in Egypt. People in ancient times, used this stone to protect themselves from evil spirits and at that time it was considered a indication of miss-happening if it changed the color but later it was found that some Turquoises change color because of light, chemical reaction and dust. Let’s know in depth about the Secret of the Blue and Green color of Turquoise – Turquoise is a combination of aluminum, copper and phosphate with a good hardness on mohs scale (6). It comes in sky blue to green blue color. The percentage of copper is high (copper is responsible for the blue color) in this stone so basically this stone is found where concentration of copper is high and the green color comes because of iron and chrome mineral. Sometimes in low grade quality, a visible matrix also can be seen by the naked eyes. In big size stones over 10×8 sizes, it is difficult to get clear quality without color variation and matrix so in big sizes, slight spots are acceptable. If you pay more than the regular price then you can get matrix free quality also. When we talk about best quality of turquoise stone then it comes without any matrix and also with an equal distribution of blue color all over the stone. Arizona (The united states), Tibet, China and Iran are the famous origins for natural turquoises and turquoise from Arizona which is also called ‘sleeping beauty’ is high in demand because of its pleasant color. Supply of good quality Turquoise has became very low because the deposit has already depleted and now low quality material is available in mines and most important thing is that there is no replacement for this color. Kingsman and no. 8 are other qualities which come from china, iran and Tibet and appearance of these is not attractive if we compare to turquoise from Arizona. Turquoise from Arizona is more famous than Turquoise from Tibet. Arizona (USA) Turquoise surpasses the Tibetan Turquoise in terms of demand and price. USA Turquoise has iron rather than aluminium. It is rare to found Turquoise with nice sky blue color with no matrix or veins. White spots, cracks, lines, dots are types of inclusions or impurities found in Natural Turquoise Cabochons. Like Moonstone and Lapis, cabochons are widely used.. If you talk about the latest jewelry designs then small size Turquoise starts from 1.5mm and up to 3-4mm are becoming very hot sizes and we keep all these sizes in our stock all the time so we can complete our customers’ requirements instantly. Natural or Stabilized Turquoise – Turquoise raw materials are quite brittle and pale color which comes directly from mines even though manufacturers cannot use this in cabochons manufacturing because of its softness and that’s why resin is used in this and it is called Stabilized Turquoise which is known as Natural Turquoise in the market. Naturally it comes porous and that’s why resin can be easily injected inside it and it enhances the hardness of the material. All this process takes place just after getting material from the mines. Resin insertion is not any treatment and it’s a natural process and understood in the market. Without putting in resin, Turquoise can not be cut in cabochons or for any other cuttings because of its very low hardness. Color Enhanced Turquoise: The quality of Natural Turquoise material is degrading day by day and the supply is also not easily available. This is the reason behind the use of manmade Turquoise in the market. This is not completely manmade, just added color enhanced minerals, resin and plastic. The market name of this type of Turquoise is‘Dyed Turquoise’ or ‘Howlite’. In short description, first bleaching powder is used to remove the natural color and then dying is use to color it again. The final product comes in nice color, no spots and no dots. Sometimes brown lines and spots are also used to make it imitate the natural one. It is quite easy to differentiate between natural and dyed material. 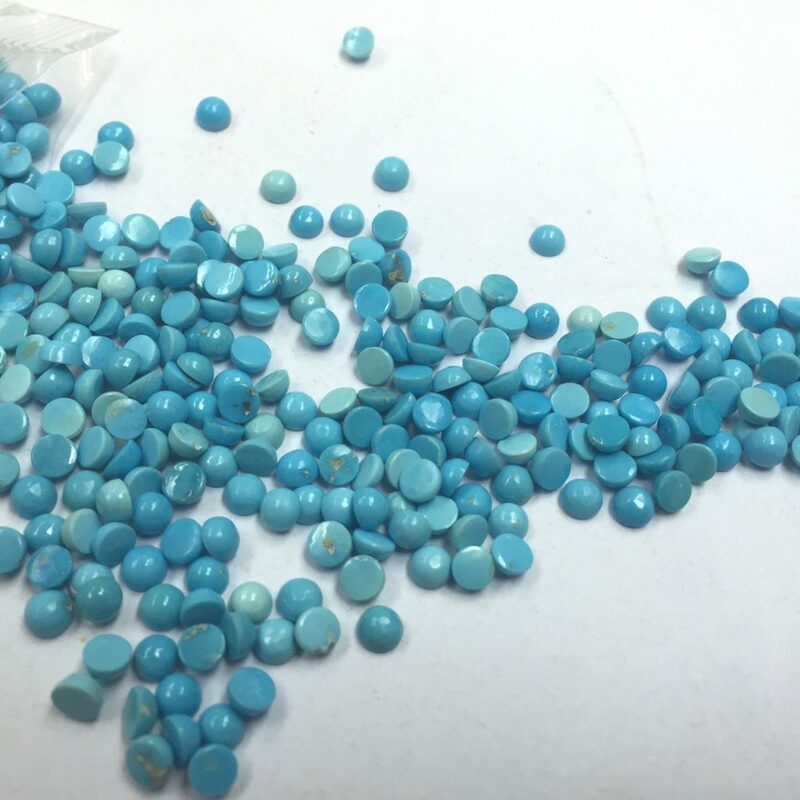 Uneven color distribution and matrix are parameters to identify natural Turquoise or you can take a small test by using HCL, Acetone or alcohol. You simply use a small piece of cotton and rub on it, if the color comes off then it is dyed or otherwise it is original. Original material color remains mixed blue and green, whether dyed quality comes with even color all over the stone without any bad spots or lines. There is not any stone which comes with the same color like Turquoise. The beauty of Turquoise is its color. This stone has been consistently in high demand for a long period. Users buy Turquoise jewelry as heirloom. ‘Color of softness’, ‘color of positivity’ and ‘color of calmness’ it can be called. Popularity of this stone has been raised to a high level and jewelers are not only using it in sliver but also in gold jewelry. Buy Loose Turquoise Cabochons straight from our Gemstones’ Factory– 1.5mm, 2mm, 3mm, 4mm, 5mm, 6mm, 8mm, 10mm round and 6×4, 7×5, 10×8 and other sizes and shapes are famous in Loose Turquoise Cabs. Well, we are manufacturing all different sizes and shapes in different qualities. Our Sleeping Beauty Turquoise cabochons are one of our main products. So far we have completed many big orders for our customers in this and are consistently supplying to them. Sometimes our clients ask us for high dome or low dome cabs with flat back and we accomplish their requirements. We cut this stone in our own factory situated in India and in Thailand. We are manufacturing 2 to 3 thousand pieces daily in our factory and so far we have not gotten any complaints from our buyers and all are happy with our services and products. We only commit for what we can do. Our experienced team and quality stones are our strength, we have a team of 4 guys who only speak with customers and send them pictures, prices and information. Now it’s so easy for you to order with us, we are just few clicks away from you. You can drop us an email on our email id (mentioned on the banner and Contact Us form). Please write the sizes, shapes and quantities you require so we can make our conversation swift and easy. If you are not from a gemstone background and want to start a business of jewelry or gemstones then we have our team to provide you with information so no need to hesitate, simply ASK us. ©2014 Navneetgems.com all rights reserved.